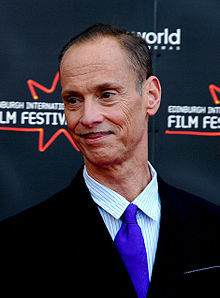 John Waters (born 22 April 1946 in Baltimore, Maryland) is an American writer, stand up comedian and movie maker. He first became famous during the 1970s. He is the director of many movies. These include Hairspray, Serial Mom, Sixteen Candles and Pretty in Pink. Waters has written books. In 1986 Crackpot: The Obsessions of John Waters was published. Waters has acted in several movies. He did the voice of a gay man called "John" in an episode of The Simpsons called "Homer's Phobia". ↑ "John Waters Biography". Biography.com. Retrieved 26 February 2013. This page was last changed on 26 July 2014, at 15:55.